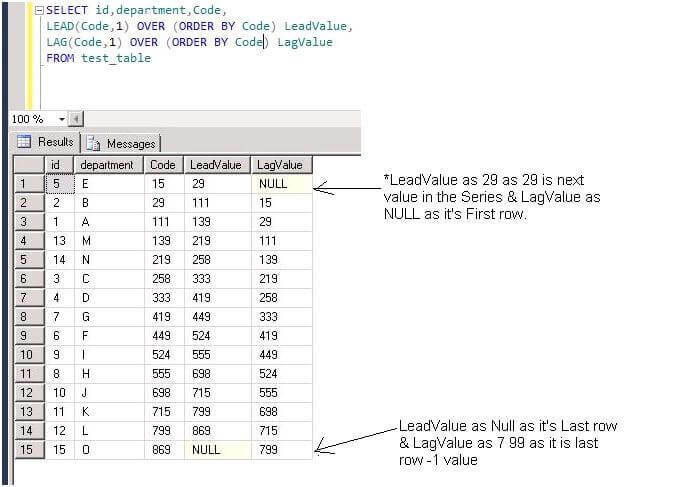 SQL Server 2012 introduces two new analytical functions, LEAD() and LAG(). In this tip we will be exploring these functions and how to use them. These functions access data from a subsequent row (lead) and previous row (lag) in the same result set without the use of a self-join. 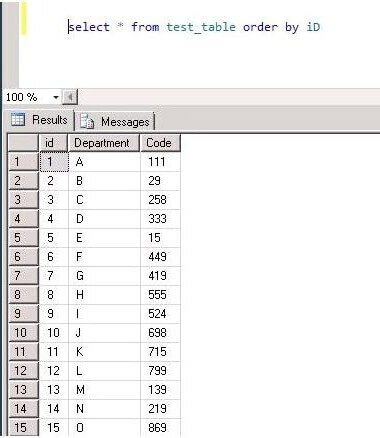 Let me explain using this example which creates table Test_table in database TestDB and inserts some data. 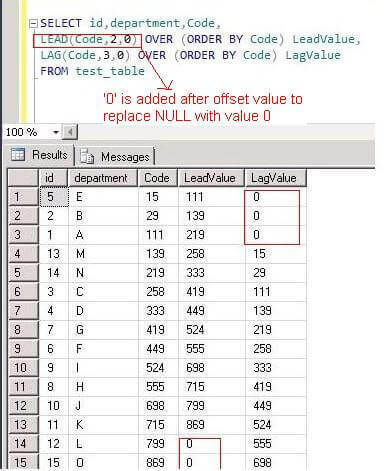 In the above example, for the first row the Lead value is the value of the next row because the offset is set to 1. The Lag value is NULL because there were no previous rows. One thing to note is that NULL values appear, because there are not values for the Lag or Lead. 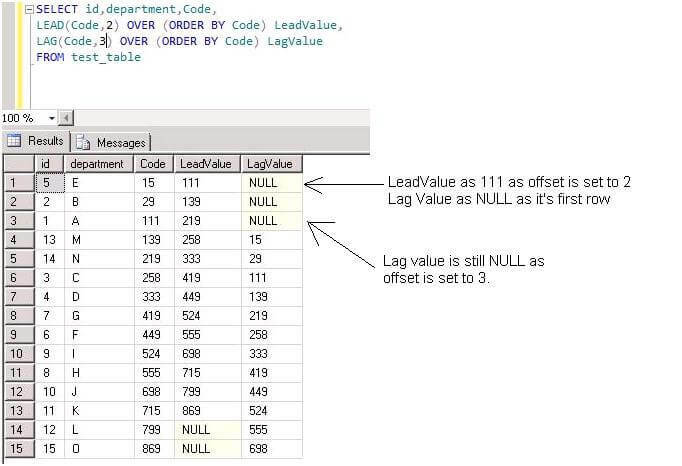 To replace NULL values with zero add 0 in Lead\Lag function as shown below. 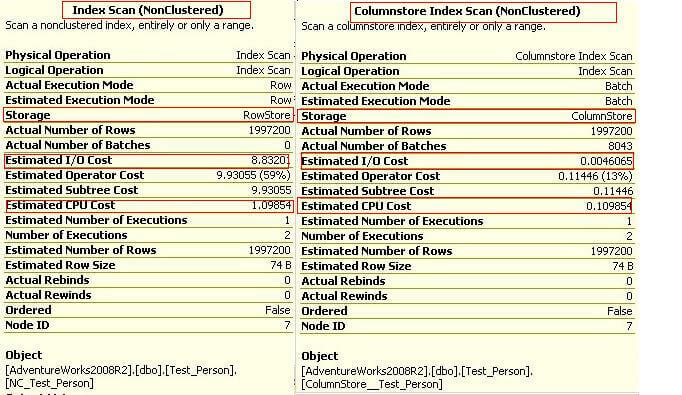 A new feature in SQL Server 2012 is the Columnstore Index which can be used to significantly improve query performance. In this tip we will take a look of how it works and how we can use it. 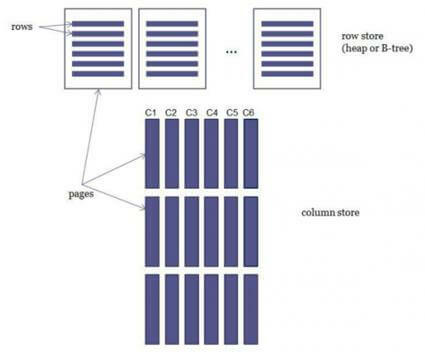 There are two types of storage available in the database; RowStore and ColumnStore. 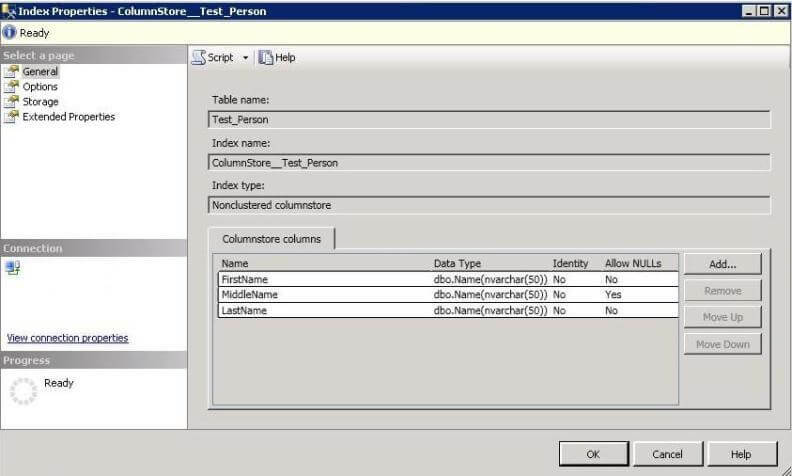 In RowStore, data rows are placed sequentially on a page while in ColumnStore values from a single column, but from multiple rows are stored contiguously. So a ColumnStore Index works using ColumnStore storage. 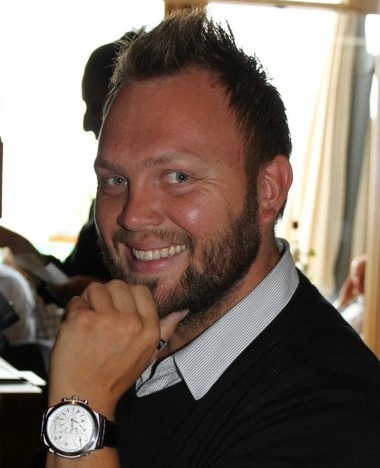 Now let’s show how we can create a ColumnStore Index and how performance can be improved. Creating a ColumnStore Index is the same as creating a NonClustered Index except we need to add the ColumnStore keyword as shown below. I used the AdventureWorks sample database for performing tests. -- We Populated this table with the Data Stored in Table Person.Person. -- As we need Plenty of data so we ran the loop 100 times. -- At this point we have 1,997,200 rows in the table. At this point we have created the ColumnStore Index on our test table. Now we will run the SELECT query with and without the ColumnStore Index and analyze performance. We have used the OPTION(IGNORE_NONCLUSTERED_COLUMNSTORE_INDEX) query hint to not to use the ColumnStore Index this time. We can see the cost when using the NonClustered Index is 59 % while using the ColumnStore index is 13%. It is clear from the results that the query performs extremely fast after creating the ColumnStore Index as the column needed for the query is stored in the same page and the query does not have to go through every single page to read these columns. We cannot perform DML ( Insert\ Update \ Delete ) operations on a table having a ColumnStore Index, because this puts the data in a Read Only mode. So one big advantage of using this feature is a Data Warehouse where most operations are read only. then rebuilding the columnstore index after DELETE is complete. 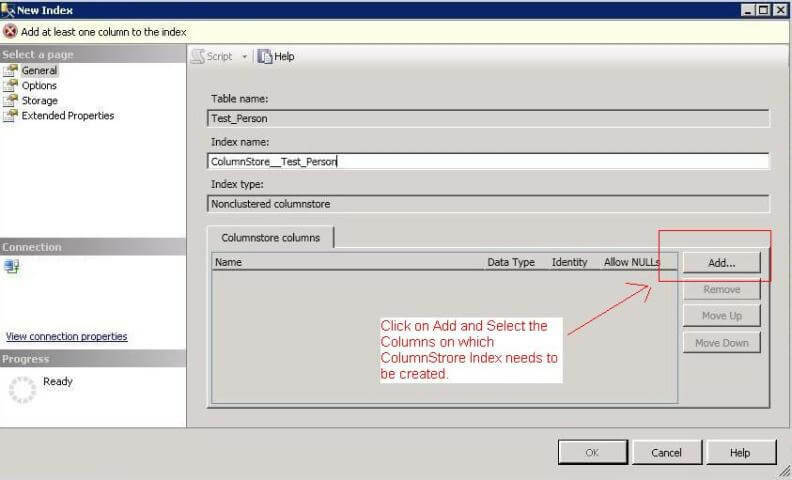 Click add to add the columns for the index. After selecting the columns click OK to create the index. It cannot have more than 1024 columns. 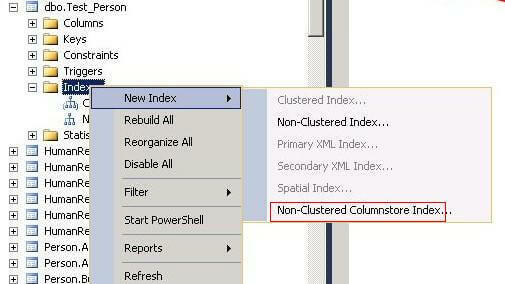 It cannot be clustered, only NonClustered ColumnStore indexes are available. It cannot be a unique index. It cannot be created on a view or indexed view. It cannot include a sparse column. It cannot act as a primary key or a foreign key. It cannot be created with the INCLUDE keyword. It cannot include the ASC or DESC keywords for sorting the index.